Santa Monica, Calif. (June 16, 2011) In a nod to the “power of the people,” movie-goers across the country now have the opportunity to vote to bring The Undefeated, which chronicles Sarah Palin’s rise from obscurity to national prominence, to their local neighborhood theaters following the initial theatrical debut July 15 at select AMC theatres. Distributors ARC Entertainment and Cinedigm Digital Cinema Corporation (NASDAQ: CIDM) encourage interested movie-goers across the country to cast their vote at www.cinedigm.com/theundefeatedmovie. Stephen K. Bannon, award-winning filmmaker, wrote and directed the film, which was produced by Victory Film Group’s co-founder, Glenn Bracken Evans and Dan Fleuette. The Undefeated was independently financed by Victory Film Group and its partners. The film includes leading prominent political commentators, such as: Mark Levin, Tammy Bruce and Andrew Breitbart as well as conservative activists: Kate Obenshein, Sonnie Johnson and Jamie Radtke. 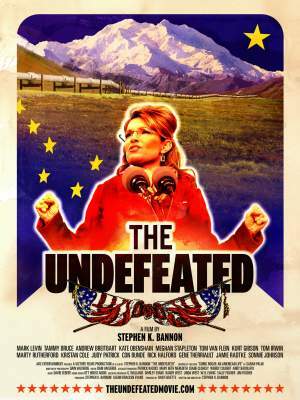 Additionally, the film features interviews with Alaskan civil servants, elected officials and advisors who were involved in Alaskan politics during Governor Palin’s tenure. To have The Undefeated premiere at your local theatre, cast your vote at www.cinedigm.com/theundefeatedmovie.